Surfcasters out on the west coast have been bringing in lots of snapper, mainly school fish. Kevin from Fish City Hamilton reports the Coromandel area has been very productive. Up by the mussel farms is excellent fishing at the moment. School snapper are being caught all the way up the coast of Coromandel. I have only been kitefishing for four months. On Anzac day I went to Karioitahi beach and did three 10 hook sets. It was a great day, we caught four kahawai, four gurnard and three snapper. The photo shows our largest one which weighed 10.1 kgs. Bodo was out at Muriwai Beach last Thursday kitefishing with a Flexiwing Rig and Skyhook. He ran two sets of 5 hooks for 5 snapper up to 7.5kg and two kahawai. On Friday he returned to Muriwai for another go with his Flexiwing Rig, this time setting 10 hooks once for a total of 5 snapper, 2 gurnard and two kahawai. With the lighter winds on the Friday Bodo used the Flexiwing Kite, Skyhook and also used a large Pocket Sled Kite about 500 metres back from the main kites to keep the mainline out of the water. Bodo was extremely happy with his two day results but disappointed that the weather didn't allow him to take any photos on the beach. The west coast is still producing good catches of snapper and gurnard and it does not seem to matter which rig is being used. It is looking really good for winter kitefishing so don't be tempted to put the gear away just because it is a little cooler, you could miss out on some great fishing! 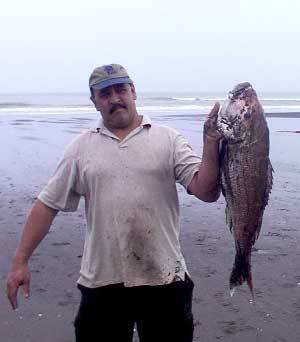 Kitefishers on Kariotahi Beach are catching snapper up to 10kg with plenty of gurnard and kahawai also being taken. David Billings, the Kite Fishing Club weighmaster, was out at Kariotahi last Wednesday and ran one set with his Bottom Longline Rig just before sunset. David pulled in 6 fish including two snapper a couple of gurnard, kahawai and one small shark. Dave reported that a nice snapper of around 10lb was caught on Kariotahi Beach the same day by a kitefisherman near where he was fishing. Daniel Scarlett reports Muriwai is also fishing well. He was out there last Thursday and set his Bottom Longline Rig twice and caught several kahawai and gurnard using squid and mullet for bait. Daniel is keen for the winds to go back to the east so he can have another go on the west coast. Bernie, a keen kitefisher who popped into the shop recently, reported he was up by the bombing range end of Muriwai Beach last Thursday in the rain and fished his Flexiwing Dropper Rig successfully throughout the appalling conditions. The Flexiwing Kite withstood torrential rain and squalls for the whole day and never looked like coming down even though they were very hard to see when set, due to the conditions on the day. Bernie ran 3 sets of 5 hooks baited with mullet on his Flexiwing Rig for a total catch of 8 snapper up to 5lb, 4 gurnard and 2 kahawai. This is almost a 100% strike rate. It doesn't get better than this and Bernie can't wait to get out on the beach again. 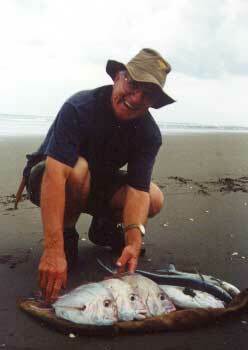 He was not the only one having success that day on Muriwai. Another party fishing up the top end of the beach pulled in a couple of 10lb snapper and one over 15lb. A great haul from their Bottom Longline Rig. There are currently lots of kingfish around Doubtless Bay. Mark from Coopers Beach Sports reports there are also good numbers of big trevally about in the Bay. According to Mark, the snapper tend to come back on the bite after a good blow so it should be firing up there right now. Kitefishers around the Tokerau Beach area should be looking forward to a successful weekend of kitefishing. The Ramco Cup was held in the Bay of Islands last weekend. Due to the bad weather most of the boats did not get out too far. Warren from Dargaville Marine and his team just missed out on the Cup on the last day of fishing. The winning snapper was taken out off Cape Brett and weighed in at 12.6Kg. Roger Martin kitefishes Ripiro Beach with a Dropper Rig. Over Anzac weekend he decided to try surfcasting for a change. Using a variety of baits Roger caught trevally and snapper. Roger says anyone with their longlines out in the easterlies would have had a great haul of fish. The Manukau is still fishing well. We were out last weekend and had a great time hauling in some good sized trevally. We did not strike any kahawai at all. Fishing on the incoming tide we managed over 20 fish for 4 hours of fishing. The full moon and big tides did not seem to affect the fishing at all. The fish were hitting the baits hard and for the first time in almost a year we had three gut hooked fish. One on the Target Hooks and two on the Kahle hooks Mark was using. An excellent mornings fishing and all good sized fish. We live at Port Waikato and weather permitting, launch our small boat off the beach and head west about 10 minutes. Two weeks ago I purchased a packet of size 5 Target hooks as a one off to try. We put the boat in last Saturday, (20th) and after very little happening and after moving 3 times, I decided to try one of your hooks. I put it down 15 times and caught 15 fish!! Not all snapper, some Kawhai as well. That had me sold! Yesterday we launched off the beach at 7.45 am and were back home at 10.00 am. We had on board 11 snapper and 3 Kawhai which in total weighed more than 50kg. ( The spring weight we have only went to 50 kg and was fully extended and we still did not have the bag completely off the ground). We were both using your Target hooks and threw back the small fish we caught. The fish were all caught through the lip so were really easy to de-hook, only one really big snapper swallowed the whole thing. We had 3 hooks and lost them all. The first one, Lionel pulled the wire with pliers instead of the hook that the large snapper had swallowed. On the second one, I had a big fish on and the swivel broke. The last one, I had put my new rod and reel in the rod holder to help Lionel net a large snapper and the fish that took my bait was that big it broke the the rod holder right off the side of the boat and took everything with it! (Stupid had not put the ratchet on ). I don't very often do things like this but thought I would write and tell you just what a success the hooks were. I have fished for snapper for a lot of years and very seldom go home with out them, but never have I caught so many big fish so quickly and they were so easy to get off. I'm off now to find some more hooks and to price up some new gear. It would take the new rod and not the old!!! If you want to recieve this newsletter Free!